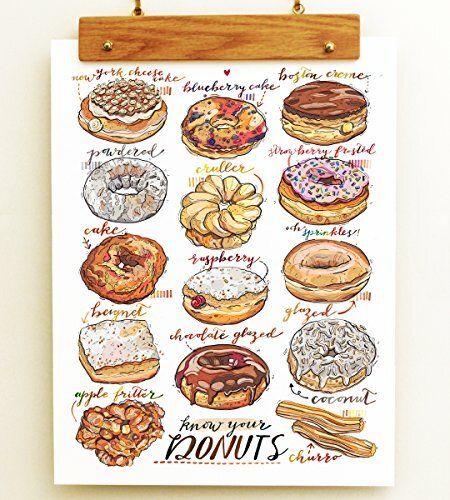 This colorful fine art print features a selection of delicious donuts. A perfect print for the kitchen, or a gift for your favorite foodie or bakery enthusiast. Print of my original illustration. Signed in pencil on the back. Printed on Epson Velvet Fine Art paper: a luxurious and sturdy 260gsm professional 100% cotton fiber paper. Print size: 8x10 or 11x14 Packaging: your print will be carefully packaged in a glassine sleeve and mailed USPS first class in a flat sturdy mailer, to ensure it arrives on your doorstep in perfect condition!